In terms of statutes this announcement is already overdue. Notwithstanding the fact that it will be delivered perhaps a fortnight after the monetary policy is due, the country's central bank chief's policy position remains highly anticipated against the background of sustained fiscal and monetary related macro-economic fractures in the economy. As public debate rages on, many different schools of thought are coming forth, with disparate and sometimes diametrically opposite views on how the country's monetary landscape should shape out going forward. The bond notes in circulation are therefore a representation of this "local currency", disguised as "greenbacks -- $2 bond notes" or "purplebacks --$5 Bond notes". Some economists have argued that bond notes are not currency, but they are merely a transactional convenience, just the same way electronic balances in our mobile wallets are only useful for transactional convenience, nothing more. But such is the nature of "money". It is primarily a medium of exchange, before it is anything else. 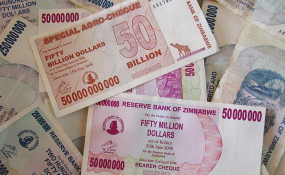 The major problems, however, come in the fact that in pursuing that policy, some fundamental rules governing money itself have been flouted left right and centre and it is these rules that we must begin to respect, if Zimbabwe's currency conundrum is to be resolved. The direct consequence of foreign exchange shortages on the formal market is that we have a multi tier pricing system in the economy. It is now common place that if one tries to buy a property in the suburbs, a motor vehicle, domestic capital goods or even groceries down town, you can be asked to pay a lower price in US$ cash, a slightly higher price if one is paying in bond notes and an even higher price if one is transacting on electronic platforms. From this entry point, the currency equation requires the government's immediate attention. We have to ask ourselves what we are losing as an economy by allowing the "incorrect pricing" of vital resources such as foreign currency. Thirdly, there is potential for rent seeking behaviours in the formal markets due to the scarcity factor. Those with privileged access to foreign exchange can and will take advantage of the shortages to enjoy "rents". Lastly the shortages have resulted in economic "dead weight loss". This is the lost economic value (welfare) due to inherent economic inefficiencies accruing to no one in particular.